Composed by Vittorio Monti (1868-1922). Edited by Kurt Sassmannshaus. Stapled. Barenreiter's Concert Pieces. Instructional. Piano reduction, part(s). 43257 pages. Baerenreiter Verlag #BA08975. Published by Baerenreiter Verlag (BA.BA08975). ISBN 9790006539277. 30 x 23 cm inches. Text Language: German/English. Preface: Kurt Sassmannshaus. 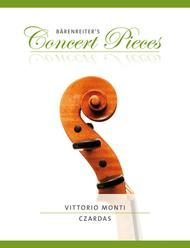 Czardas by Vittorio Monti is a popular as well as a fiery concert and encore piece. Tonal finesse and the lively interplay of tempo, dynamic and character changes constitute its special attraction and offer young violinists, who are already comfortable in 1 st and 5 th position, a wealth of possibilities for experimenting. The seriesBarenreiter's Concert Piecesis edited by Kurt Sassmannshaus, the internationally-renowned violin teacher and co-author of the Sassmannshaus violin school tradition. His forewords introduce these little gems and include tips for successful first concerts. The editions form an ideal continuation of the Sassmannshaus violin school tradition; they can be used in parallel from the third volume onwards or alongside any violin method. The editions contain a solo violin part and a piano reduction for the accompanist. The series will be continued and will introduce the student to more demanding repertoire with an increasing level of difficulty.